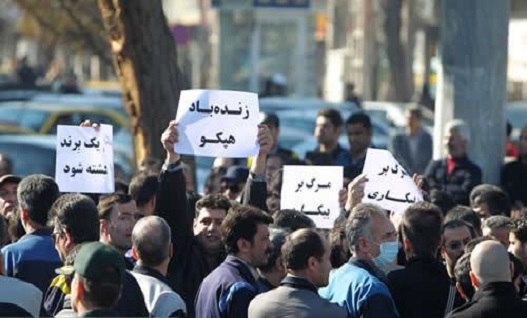 Workers of HEPCO, an Iranian heavy construction equipment manufacturer are reportedly facing charges brought against them by the judiciary as result of their protests. A report by an unidentified labour activist to Jameeh Farda daily on Wednesday December 20 reveals that following the protests twenty workers from Heavy Equipment Production Co. who were among the protesters were summoned by the judiciary and informed of charges being brought against them. The workers have reportedly been texted their file numbers by the Markazi Province Justice Department. They are being charged with “disturbing peace and order and participating in illegal gatherings”. Workers of HEPCO located in the city of Arak commenced protests at the worksite last December and later took their protests to the streets. While government officials reported that the demands of the workers of HEPCO had been met, the protesting workers were attacked by security forces last September. The minister of labour travelled to Arak and reported that some of the workers’ delayed wages were now paid out resolving most of the disputes. However, workers report that while they have not been paid two months wages from last year, the employer has also failed to pay them for the last two months. Meanwhile HEPCO administration promised the workers that they will receive all their due payments and that they are looking at increasing production. The Provincial Council has reportedly given the Company one month to clear its debt to all workers. Workers report that in compliance with an order from the Provincial Council they attend work each day but are facing serious reprisal from the employer and are under persistent stress. Reports indicate that the workers are now being monitored for all their communication activities in social media and many of them are now refraining from participation in chat rooms in fear of their security. The fear of dismissal has also become a serious concern for HEPCO workers. In March the HEPCO forced a group of workers to go on unpaid leave. A chief HEPCO Project Manager, Massoud Rezai has referred to the protesting workers are “terrorists”. Rezai had previously described the workers as belonging to four groups of loyalists, mercenaries, hostages and saboteurs adding that the saboteurs are “seeking to destroy the reputation of the Company”. Rezai has now stepped up his accusations and is identifying the protesters as “terrorists” and calling for thier “elimination”. While the Company’s accusatory stance has overshadowed the protests, the workers insist that their protests have been consistently peaceful and their demands nothing more their minimum due. The HEPCO labour protests are only one of the many labour protests in process across the country as numerous companies have been facing financial difficulties in the country’s ailing economy and are struggling to remain afloat by foregoing their responsibilities to their employees.